Discussion in 'The Lobby' started by ResearchMonkey, Oct 15, 2009. Puppies are nice. Might you and the boys select one? No. Sadly, Paul does not want a puppy. Ah, I see. Still,puppies are nice and who doesn't love puppy breath. What if I bring Les and the boys a puppy as a present? Will you make them give it back? or something, i REALLY don't want a dog. I do!! They should bottle it and sell it!! I jones for it all day long!! Shhhh! I have 4 of them, and they have all been strays. Don't say anything to the cat people....... but canines are better. They love you more and they show it. Every time they lay eyes on you they think "Ooooh, there he is! I love him!" "Ooooh, there he is! I love him!" Your dog thinks you are guy? I was using "you" in the "collective" thankyou, very much! I should have said s/he? Damn your PC, anyway! I agree that dogs are more loyal and generally a bit better as pets than cats. Like I said, I wanted a dog, but Jody insisted on cats or nothing. As it turned out though we got some TRULY exceptional kitties. These guys are dog like in their love for us. The little guy who was sick is also an AMAZING story of survival I will share with you guys soon. You know, there's a reason they don't call it "Three Cat Night." 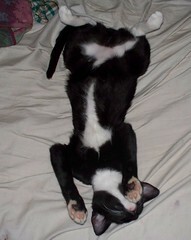 My kitteh sleeps like that too! Puppies are cute... but then they grow up & roll in duck corpse. You have to think about dogs like boys. My dog on a recent walk. And snack in the cat litter. 27f on my car's thermo this morning. Good think I powered up the pipe heaters yesterday.